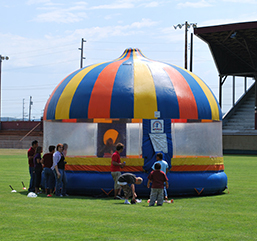 SINCE 1981, WE HAVE BEEN PROUDLY SUPPLYING THE PACIFIC NORTHWEST WITH EVERYTHING FROM BALLOONS TO BOUNCY HOUSES, CLOWNS TO CARNIVAL GAMES, SUMO WRESTLING TO CIRCUS TRAINS- AND EVERYTHING ELSE IN BETWEEN! No matter what size the picnic, birthday, or other event, Clowns Unlimited has been there with the best entertainment packages available. With offices located in Seattle Washington we have the ability to offer a much larger amount of smiles than your average clown! In fact, we aren’t your “average” clowns. Clowns Unlimited offers a wide array of event resources and entertainment options, ranging from party bouncers, interactive games to the most amazing rides imaginable. We can take any birthday, picnic, or festival event, and make it memorable. Sporting hundreds of wild attractions, and responsible attendants to operate them, your entertainment worries are over! Have an idea you aren’t sure will work? Give us a call! We’ve probably seen it done. We’ll share our years of experience and tell you which of our activities will go over big at your next event. We’ll do all the work- and you take all the applause! We’re the perfect party outfitters. AT CLOWNS UNLIMITED OUR FESTIVE ATTRACTIONS ARE THE BACKBONE OF ANY EVENT, AND OUR CLOWNS CREATE THE FUN ATMOSPHERE THAT MAKES IT SPECIAL. Whether you are planning a company picnic, birthday party, school carnival, grad party, festival or store promotion. No matter what size event, Clowns Unlimited has the entertainment package to meet your needs. We can create long lasting memories for your child, increase traffic to your store, or add immeasurable excitement to your fundraiser. Our professionalism, timeliness, and dedication to your needs will allow you to rest assured that your event will be a success!